Original Editors - Kelli House and Kelly Condren, Student Physical Therapists from Bellarmine University's Differential Diagnosis of Complex Patient Problems project. Several factors influence how well the joint can fight the infection including other systemic issues occurring throughout the body. For example, patients with liver or kidney disease, or diseases that make the joint more susceptible to damage such as RA can all cause poorer outcomes . The best outcome for individuals with septic arthritis is immediate treatment. Fifty percent of adults with septic arthritis have significant decreased range of motion or chronic pain after the infection. Poor outcome predictors in prognosis of septic arthritis include the following: Age older than 60, infection of the hip or shoulder joints, underlying rheumatoid arthritis, positive findings on synovial fluid cultures after 7 days of therapy, delay of 7 days or longer in beginning treatment. Depending on associated risk factors, infection type, and response to treatment, mortality rate from septic arthritis has varied between published studies. One systematic review stated that mortality rate was around 11% between the studies assessed. Ciprofloxacin (Cipro) - Treat N gonorrhoeae and gram-negative enteric rods. Cefixime (Suprax) –Broad activity against gram-negative bacteria, by binding to one or more of the penicillin-binding proteins. Arrests bacterial cell wall synthesis and inhibits bacterial growth. Oxacillin - Oxacillin is useful against methicillin-sensitive S aureus (MSSA). Vancomycin (Vancocin) - An anti-infective agent used against methicillin-sensitive S aureus (MSSA), methicillin-resistant coagulase-negative S aureus (CONS), and ampicillin-resistant enterococci in patients allergic to penicillin. Linezolid (Zyvox) - An alternative antibiotic that is used in patients allergic to vancomycin and for the treatment of vancomycin-resistant enterococci. Management regarding antibiotic choice, dosage, route of administration, and duration of treatment is unknown in the treatment of septic arthritis. In addition, no evidence has shown if closed aspiration or open arthroscopy is better at removing materials from a joint that’s infected. Needle joint aspiration can be used as both a diagnostic tool and a treatment. A portion of the fluid can be taken out by aspiration needle to determine the type of bacteria causing the infection thus determining further course of treatment. Septic arthritis is also known as infectious or bacterial arthritis and involves a local response causing inflammation of the synovial membrane of the joint affected. This is due to the invasion of bacteria, viruses, or fungi directly into the synovial membrane of the joint. The most common cause is bacterial, more specifically staphylococcus aureus, streptococci, or gonococci, a bacteria transferred via sexual activity. It can also be caused by viral infections such as Hepatitis B or Rubella. Direct inoculation via surgery, arthroscopy, injection, central lines, or total joint replacements. A wound that that breaks the skin such as a bite, cut, or open fracture. Another systemic infection such as osteomyelitis, cellulitis, diverticulitis, or an abscess reaches the joint causing another infection. Rarely seen is a case of Infectious Arthritis as a complication from ACL reconstruction due to contaminated bone-tendon-bone allografts. The initial treatment of infectious arthritis is outside of the scope of physical therapy. It is important, first, for the physical therapist to recognize the signs and symptoms of the infection and refer out for other medical treatment. 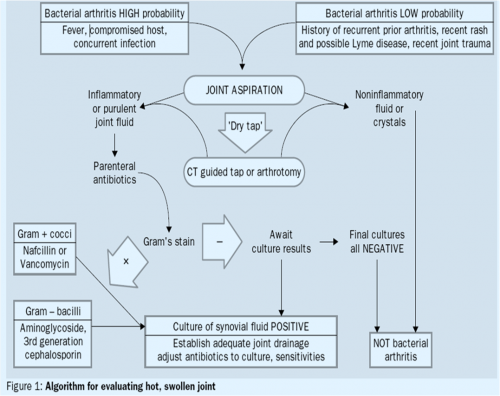 Subjective history, in combination with the physical therapist’s objective findings, is important in order to recognize the risk factors that make septic arthritis the likely diagnosis. It is important to immobilize the joint in this stage to best manage the patient’s pain and to decrease likelihood of doing further damage to the joint until proper treatment can occur. Once the patient receives a round of antibiotic treatment in combination with either joint aspiration, debridement, or arthroscopy, the patient may then be referred back to physical therapy to be educated on how to properly protect the affected joint. Gentle mobilization of the infected joint can begin if the patient is responding well following 5 days of medical treatment. Once the infection is well-managed, current evidence states the patient will usually respond best to aggressive physical therapy to allow maximum post-infection functioning. Physical therapy needs to consist of allowing the joint to be in its functional position and positioning the joint to allow passive range of motion activities. If a patient is suspected to have septic arthritis, the most important alternative diagnoses to consider are rheumatologic conditions. These include, but are not limited to, rheumatoid arthritis, vasculitis, and crystalline arthritides. Other forms of systemic arthritic conditions such as drug-induced arthritis, and all forms of reactive arthritis, may also be considered. With the immediacy of joint destruction with septic arthritis, the differential diagnosis must be performed with urgency to initiate proper treatment immediately. Additional conditions that can cause global or local joint pain and swelling that may resemble septic arthritis include: osteoarthritis, HIV infection, Lyme disease, gout, and lupus. In order to properly diagnose septic arthritis over one of these other conditions, testing of joint fluid and symovial lining must be performed. A diagnosis cannot be made on clinical presentation alone. A 56 year old female with a history of inflammatory arthritis presents with additional symptoms indicative of a joint infection. This case highlights the importance of distinguishing septic arthritis from the symptoms of a chronic inflammatory arthritis condition through both subjective and objective evaluation. A 35 year old male is diagnosed with a rare bacterial infection in the knee joint causing septic arthritis. This case addresses a rare risk factor (ACL revision) demonstrating this can occur in a younger population and the importance of immediate diagnosis and proper treatment in order to significantly reduce the recovery timeline. A 38 year old male with RA is diagnosed with polyarticular septic arthritis after receiving immunosuppressant injections to treat his RA flare up. This case addresses the need for clinicians to recognize these injections can possibly cause the joints to become infected, the need to distinguish these symptoms from normal RA symptoms, and how RA can worsen the presentation and progression of the infection. A 53 year old with immune deficiency presents with septic arthritis possibly due to complications of a series of corticosteroid injections and arthroscopic surgeries, and history of recurrent infections. This case addresses several risk factors possible contributing to his septic arthritis and the need to be aware of other underlying systemic causes that may require further evaluation. ↑ 2.0 2.1 2.2 2.3 2.4 2.5 Goodman CC, Fuller KS. Pathology: implications for the physical therapist. 4th ed. St. Louis: Saunders Elsevier; 2014. ↑ 3.0 3.1 3.2 3.3 3.4 3.5 3.6 Goodman CC, Snyder TEK. Differential diagnosis for physical therapists: screening for referral. 5th ed. St. Louis: Saunders Elsevier; 2012. ↑ 10.0 10.1 YouTube. 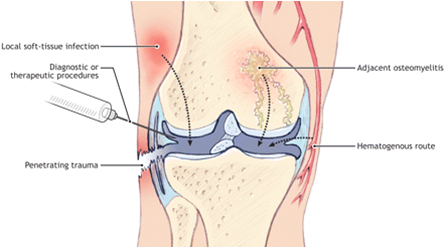 Septic arthritis of the knee arthroscopic debridement. Available at: http://www.youtube.com/watch?v=0AOv06XWCps. (Accessed 2017 April 3).